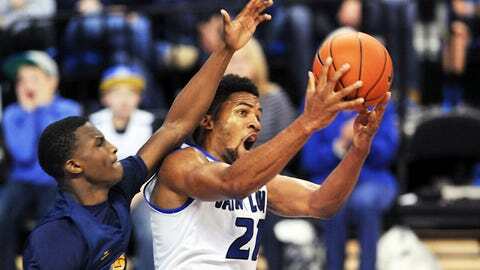 Senior forward Dwayne Evans scored 22 points to lead the Billikens. DAYTON, Ohio (AP) Austin McBroom hit all six free throw attempts in the final 41 seconds as St. Louis won its ninth straight, bumping Dayton 67-59 to remain undefeated in conference play Saturday. McBroom finished with 17 points and Dwayne Evans led the Billikens (15-2, 2-0 Atlantic 10) in a game they controlled since Evans hit a 3-pointer for a 16-14 lead at 11:04 of the first half. St. Louis is off to its best start since the 1993-94 season, is 6-0 on the road and boasts the best shooting-percentage defense in the A-10. It showed Saturday as Dayton (12-4, 0-1), the conference leader in shooting percentage, was held to a season-low 30.6-percent shooting. The Flyers’ Devin Oliver, a 54-percent field-goal shooter at 12 ppg, scored 26 against Ole Miss in an overtime win Jan. 4 but was shut out by the Billikens on 0-12 shooting. Jordan Sibert paced Dayton with 15 points.